Another week, another party conference that seems longer on talk than action on the housing crisis. Like the Liberal Democrats in Brighton, the Labour party in Manchester made all the right noises. It even advocated many of the same policies – if you can call carefully crafted aspirations policies. As I noted in my blog for Inside Housing on Monday, the headline commitment by Ed Balls to funding 100,000 affordable homes and a stamp duty holiday from the proceeds of the 4G mobile phone auction is not actually a policy commitment at all, just a call for the government to do something in the next two years. If Labour wins the 2015 election, George Osborne will have already spent the money (almost certainly on something else) and in the absence of another one-off windfall housing will have to take its place in the queue for the zero-based spending review planned by Balls. His speech this week is a promising signal that housing could be a priority but no more than that. Later in the conference there was another nod in the direction of social rent when shadow communities secretary Hilary Benn introduced Islington’s cabinet member for housing James Murray as an example of what Labour councils are achieving. Murray told the conference that accepting affordable rent would have trebled the rent for a two-bed flat in the borough and explained how it was insisting on social rent instead. Labour delegates went on to back a motion calling on the party to commit to a new programme of social housing programme, reject affordable rent and address security of tenure and above inflation rent rises in the social sector. That was the visible part of what was happening on housing at the Labour conference. Away from the conference hall, countless fringe meetings on everything from garden cities to private renting (many of the same ones will be held at all three party conferences) provided indications of how policy is evolving. In fairness, the midway point of a parliament is not really the time to expect the opposition to get too specific. As Robbie de Santos notes on his blog for Shelter, there are some promising indications of a party political arms race on housing. Things certainly seem to be moving in the right direction on a number of fronts even if, as Chris Giles argues in the FT this morning, lack of real support for large-scale development is likely to mean a ‘small and expensive’ housing future. However, in the meantime Labour’s welfare policy appears stuck in a depressing timewarp. Shadow work and pensions secretary Liam Byrne has been making the point in interviews all week that Labour needs to reinvent social security to respond to a shift in public opinion and growing resentment against benefit claimants by some sections of society. That means Labour will look to make further cuts in the welfare bill after 2015 and that Byrne supports the idea of a benefit cap provided it could be set differently in different parts of the country. The problem with the last bit is that a total benefit cap is effectively a housing benefit cap because that is the thing that varies around the country – but we already have a whole series of housing benefit caps that vary by local area. Regional caps might look fairer on the surface but in reality they are an open invitation to Conservative welfare ultras who are advocating further reductions in the total cap as part of £10 billion more in welfare cuts. ‘I suppose I might have expected a progressive politician of the left to argue something rather different alongside this. To make a vigorous case for the value of social protection, especially now. To argue that Labour should be setting a different agenda – to stand on the future side of the issue, if you will – and to challenge the stigmatisation of benefit recipients as feckless scroungers. 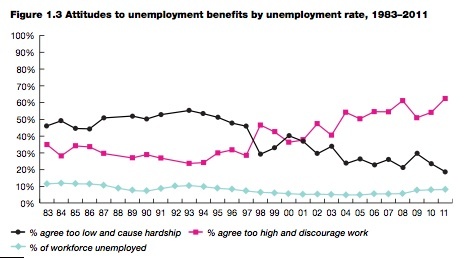 To acknowledge that a more precarious labour market demands a more comprehensive response from the welfare system. Smarter and more flexible, certainly, but there to catch all those who fall on hard times. And I might expect them to temper their enthusiasm for getting people back in to work with an acknowledgement that there needs to be work for them to get back into, otherwise the risk of punishing the victim is high. And so the party conference season moves on to the Conservatives in Birmingham next week. While the other two parties talk the talk on housing policy, the Conservatives in general and the pioneering Tories of Hammersmith and Fulham in particular are walking the walk. And while Liam Byrne takes his cue from public opinion on welfare, prepare to hear more about the next stage of the Conservative reform plan already signalled by David Cameron.